MAANZ is working on several different projects at any one time. The skill diversity of those involved in the organisation allows a wide range of interesting activities to be undertaken. 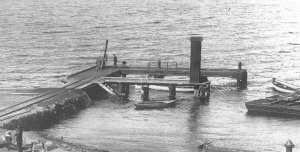 The Patent Slip in Evans Bay was a strong element in the growth of early Wellington, the slip providing its service for over 100 years. MAANZ members have spent many hours both above and below waterline assessing what remnants of the slip still exist. Since 2002 MAANZ has been active in seeking protection for the site. This culminated in about 2/3rds of the remaining site being gazetted as an historic park. NZHPT has kindly provided a copy of the Registration Report for a Historic Place - 'Information Upgrade Report' for the former Evans Bay Patent Slip. An important project is the development of a conservation guide for divers who recover material from the ocean floor. The guide will explain what is safe to remove and what is best left, as well as detailing the current laws on such artefacts. Most importantly it will give basic advice on how to start the conservation process. Development of a New Zealand guide including New Zealand laws is currently on hold..
Protection of recovered maritime artifacts in an emergency is essentially to keep the items wet until expert advice can be gained. If there is one thing we do not lack, it is an amazing array of interesting subjects for consideration as MAANZ projects. As an organisation of voluntary members we cannot work on all of them, however we do record them and reactivate them when the time and resources allow.